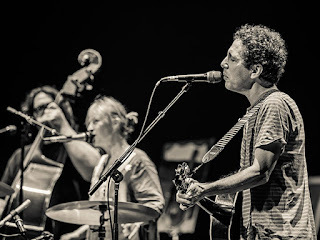 Comment: by listening to this 24-track live gig by legendary Hoboken, US-based indie purveyors Yo La Tengo I would like to share some moments which emerge from their conception and music. Firstly, YLT is a thoroughly American combo which used to play principally country music though with a different, introverted posture. They are indie nerds who not dare to present their music loudly. However, it seems to be the protective pose of theirs which eventually contributes to their idiosyncratic image. Of course, these words could only be said about their live sessions which are absent with studio trickery and synthesised and psychedelic sound creation. Secondly, they prove again to be champions of the cover songs. There they convey their own versions of songs by the likes of The Cure, Minutemen, Lovin` Spoonful, Gene Clark, Special Pillow, The Scene Is Now, and Cat Stevens. In a word, their session is highly relaxing and enjoyable.